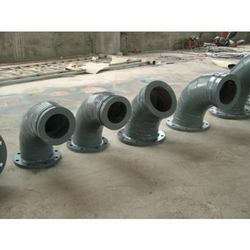 Cast Basalt Lining product Information and specifications Cast Basalt Lined Pipes can be cast into virtually in any shape. The cast basalt linings are mainly used in the pipelines, bends and tiles to make them more durable and to provide longer service life. 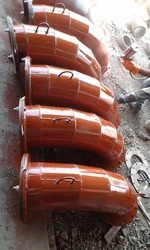 We also specialize in customization and can be manufactured as per our clients drawing in very short time. They are available in form of pieces as well as in standard sizes, tailor-made to fit the individual conveying system. We are one of the reckoned organizations engaged in providing high grade Cast Basalt that is known for its dimensional accuracy, tensile strength and long functioning life. These are fabricated using high grade mild steel and stainless steel in accordance to the requirements of the clients. Moreover, these basalts are available in different sizes and types, to suit the varied requirements of the clients. Friction Resistance - As more material is passed over Cast Basalt it gets polished up thereby reducing friction further. Cast Basalt improves in service after getting polished. Wetting also improves its performance in practical applications. Impact Resistance - Direct Impact Resistance at 90 degree is low like all other ceramics, but it can be increased with proper installation by reducing the angle of impact. Cast Basalt is the best wherever sliding abrasion exists. Moreover, external impact strength of composite basalt pipe (enclosed in M.S. Shell) is always more than that of bare Ni-hard Pipe. Chemical Resistance Cast Basalt is almost absolutely acid/alkali resistant (except Hydrofluoric Acid) and hence corrosion resistant. 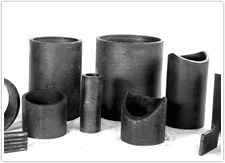 Life - Life of basalt-lined pipe is estimated to be 7 to 10 times that of Cast Iron, and 3 to 4 times that of Ni-hard Steel. Looking for Cast Basalt ?